Q. What kind of data is in the report? A. The report lists the basic information about the field at the top, like what kind of infill, when the field was installed, square footage, contacts at FieldTurf, and so forth. It also lists a measure of the “softness” of the field known as GMAX as well as temperatures on the field in October 2018. Q. What the heck does the GMAX data mean? A. There’s two different ways to measure GMAX. Our field is measured according to ASTM F1702-10 (free to read) the Standard Test Method for Measuring Impact-Attenuation Characteristics of Natural Playing Surface Systems Using a Lightweight Portable Apparatus. The ASTM was previously known as American Society for Testing and Materials, and is an international standards organization. Under the standard we use, the field should provide at least 100g of deceleration when the testing “missile” makes contact with the turf. The Somerset field most recently scored at 164g of deceleration in October of 2018, well above the baseline requirement. Q. What does FieldTurf mean in terms of heat? A. The October 2018 report showed a temperature of 126F across every location where the GMAX drops were made. FieldTurf, like all artificial grass surfaces (and indeed all surfaces other than grass, including concrete and asphalt) is hotter than natural grass. It both heats up faster and cools off faster. The Center for Sports Surface Research has a variety of published studies on heat and artificial surfaces, with one finding that “eco-infill” such as the cork granules at Somerset absorb up to 15 degrees less heat compared to crumb rubber. The heat is the primary concern with the field. But the reality of the location of the Somerset field and the historical inability to grow natural grass led to conditions in which brown, dusty, and unsafe field conditions dominated. Three different attempts to re-seed the field over ten years, including one that shut the field for nearly a full school year, failed to result in a natural grass covering that could endure. Q. What about heavy metals and other toxins? A. After installation in August 2016, Labosport PTL analyzed the field according to the ASTM F963 Heavy Metal Content Analysis standard and found no concerns, with less than 0.1 parts per million of arsenic, barium, cadmium, chromium, lead, selenium, silver, and mercury. The report is available as a PDF. A. “Play It Forward” is a one-year community campaign to raise money to renovate the Somerset ES field, replacing the current packed dirt with synthetic turf and organic, plant-based infill. The name comes from the fact that a renovated field will be an investment in our children’s healthy development by allowing them to play outside. What we build today will benefit students and the surrounding community for years to come. Q. What’s wrong with the current field? It is unsafe and often simply unusable: Grass cannot grow on the field, and the packed-dirt surface is uneven and virtually impermeable, causing water and dirt to run off to the street below. The packed dirt creates dust storms when the wind blows and turns to mud when it rains, putting the field out of use for days. Q. How does it affect the students? A. Our children don’t have regular outdoor exercise time because the field is often too muddy or too dusty. After a rainstorm, it stays muddy for three to four days. This requires the students to have “blacktop only” recess where active play and running is restricted, and injuries are common, or indoor recess in their classroom. In winter/spring 2015, the students lost approximately 30 days of outside recess on days that would have been suitable for outdoor play, had the field been in adequate condition. By contrast, synthetic turf is always ready for play. Q. Why can’t grass grow on the field? We have the smallest plot of land of any Montgomery County school. The number of children using the field and the soil makeup (which still contains construction debris from the school renovation) prevent grass from growing. Re-seeding has been attempted at least three times in the last ten years, once closing down the field for almost an entire school year. Each time, grass has been unable to last for more than a month or so. Q. How does the field affect our kids and their teachers? Our kids injure themselves on the uneven surface and their allergies are exacerbated due to dust inhalation. Para-educators supervising recess have worn face masks to protect themselves. Outdoor lineup and recess are frequently cancelled, which means our kids are unable to exercise and benefit from daily physical activity during the school day. This, in turn, affects their behavior and learning in class. Q. How much does a new field cost? The estimate given by MCPS Facilities is $550,000. The breakdown is $175K-$225K for the turf, $150K for stormwater management, $40K for a concrete curb, $60K for design and engineering, which equals $480,000, plus a 15 percent contingency. Total field size: 26,088 sq ft.
Q. Why can’t MCPS pay for this? While MCPS should be held responsible for the safety and well-being of its schoolchildren, the reality is that the school system is faced with massive overcrowding right now, as well as a budget shortfall. No other elementary school has a turf field. The high school turf fields have all been paid for privately. Q. Isn’t synthetic turf harmful to our children’s health? There was negative press and legitimate concern about the potential health risks of crumb-rubber infill made from recycled tires that is used in many turf fields. But those concerns don’t apply to the field we’re looking at for Somerset ES. MCPS adopted a policy to use only plant-derived infill for turf fields going forward. Plant-derived infill has the added benefit of remaining cooler on hot days than crumb-rubber infill. Q. How does synthetic turf impact the environment? A turf field does not need to be watered, mowed or fertilized. In addition, a new stormwater management system (in compliance with more stringent 2008 County regulations) will be installed that will reduce water runoff from the field. Q. What about annual maintenance? Annual maintenance on a field this size is estimated to run between $3,000 and $4,000. The Somerset Foundation is committing its resources to cover this annual cost. Q. What happens when the turf needs to be replaced? The synthetic turf “carpet” generally needs to be replaced every 10 years (variable due to usage and other factors). As this is County property, MCPS is responsible for replacing the turf. The drainage layer remains through 3-4 turf replacements. Q: $550,000 is a lot of money. Couldn’t we spend that money on hiring more teachers and making class sizes smaller? MCPS does NOT allow Foundations, Booster Clubs, or PTAs to fundraise for additional MCPS personnel. 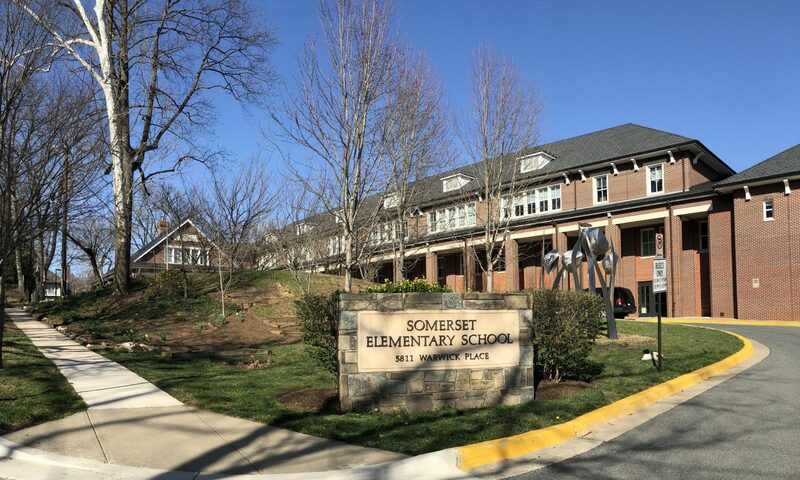 The Foundation and PTA are committed to working with our Cluster Rep and our school leadership to voice our concerns to MCPS and the Board of Education about Somerset’s growing class sizes. The Foundation and PTA are also committed to continuing their annual contributions to school needs, while leading the Play it Forward campaign. Q: What sort of support does this initiative have from the school faculty and school community? Ask any of your teachers! Principal Morris, P.E. teacher Richard House, and every teacher we have spoken to has expressed hope that we can finally do something about this field. Parent Allison Mistrett is an occupational therapist who says the children are not getting the physical activity required for learning. Parent Nancy Kadowitz is a pediatrician who says the lack of physical activity has negative far-reaching consequences on children’s health.